Several clients will receive Health Care Heroes awards on Thursday, November 5, 2015. This includes Alzheimer's Disease Resource Center, Inc. (ADRC)'s Executive Director and CEO Mary Ann Malack-Ragona for Community Outreach; Camp Pa-Qua-Tuck's Judy Kamer for Nurse Hero; Dr. Frank DeFeis and Dr. John Charos, chief veterinarians at Central Veterinary Associates (CVA), for Veterinary Medicine/Animal Rescue & Rehabilitation Hero; and McPeak's Assisted Living for Health Care Facility. The VIN News Service interviewed Central Veterinary Associates' President/CEO Dr. John Charos about his being the subject of the documentary film New York Vet. Dr. Charos was also interviewed about the film by DVM360 Magazine. PRMG assisted Pink Aid Long Island in garnering coverage of its 2nd Annual Pink Chair Luncheon and Fashion Show. This was covered by Eyewitness News First at 4 and Times of Huntington. Gershow Recycling held a Can Tab for Kids event, which was covered by American Recycler. PRMG assisted The Office of Suffolk County Legislator Rob Calarco in providing publicity for the 7th annual Play For Peace Soccer Tournament, sponsored by Gershow Recycling. This was covered by News 12, FiOS1 and GreaterPatchogue.com and appeared on the FiOS1 TV show Push Pause. 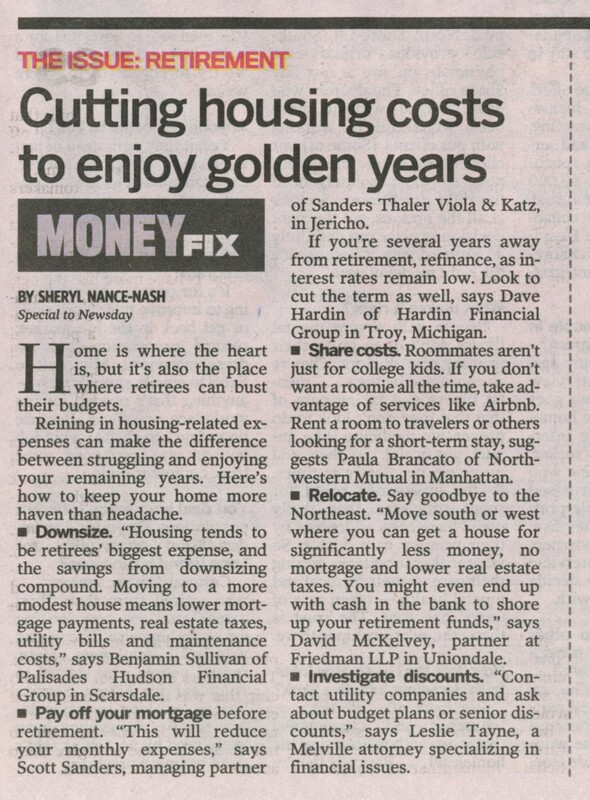 Scott Sanders of Sanders Thaler Viola & Katz, LLP was interviewed by Newsday for an article on how senior citizens can reduce their housing costs during retirement. Emma Hallowell, a student at Cornell University, received a grant from her university to study the behaviors of ruffed lemurs at Long Island Game Farm. This was reported in Newsday. News 12 also featured the Game Farm as part of its “12 Weeks of Summer” segment. Ben’s Kosher Delicatessen Restaurant & Caterers was named in Newsday’s ExploreLI section as one of the best places to eat for dinner and a movie near the AMC Loews Westbury Raceway 10 movie theater. Dr. John Charos of Central Veterinary Associates was featured in the short film documentary New York Vet. This was reported in The Queens Chronicle. Ben’s Kosher Delicatessen Restaurant & Caterers’ summer BBQ catering special was highlighted on WCBS Radio’s “Dining Diary.” Ben’s was also named “Best Deli” in The Queens Courier’s “Best of the Boro” poll. PRMG assisted The Patchogue Lions Club in receiving coverage of its annual Christmas in June, sponsored by Gershow Recycling. This was covered by News 12. 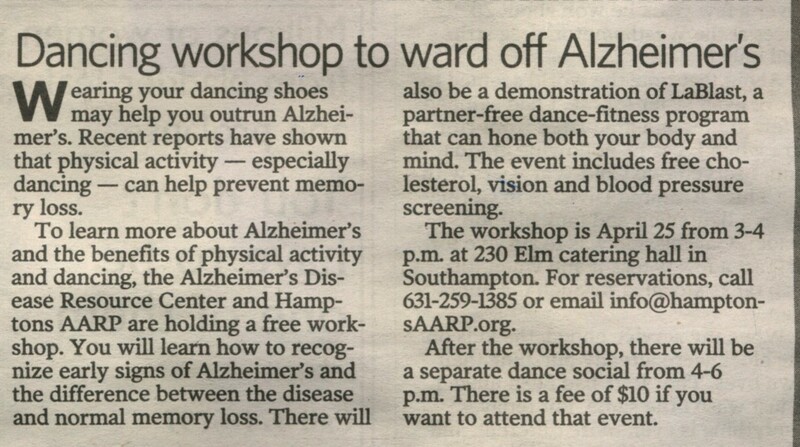 Alzheimer’s Disease Resource Center, Inc. and Hamptons AARP hosted a dance fitness workshop to help seniors exercise their bodies and their minds. This was announced in Newsday’s Act 2 section. 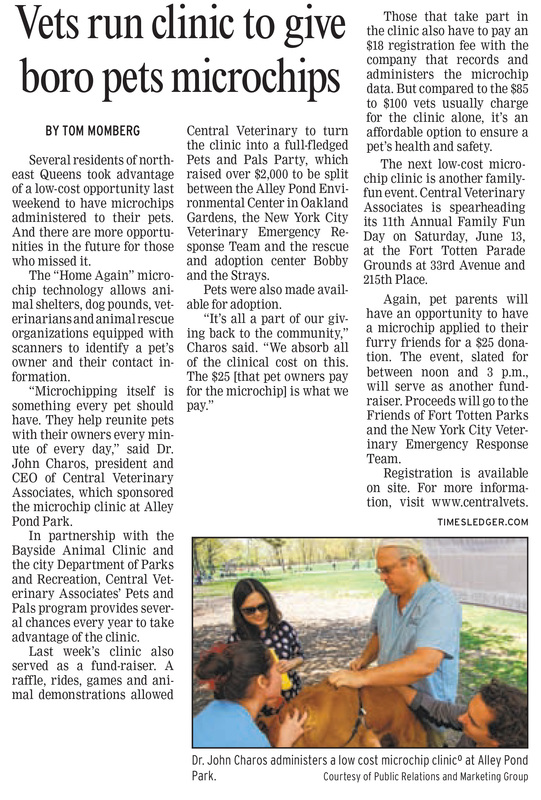 The Bayside Times reported on a low-cost microchip clinic hosted by Central Veterinary Associates at the “Pets and Pals” Party to help raise money for non-profit animal and environmental organizations. Board Member Scott Schuler and Student Ambassador Maria Roman of School-Business Partnerships of Long Island was interviewed on TV 55’s Exit 10/55 to discuss this year’s Long Island Regional FIRST® (For Inspiration and Recognition of Science and Technology) Robotics Competition. MetroBPS President Chad Horal was featured in article by Long Island Business News about the coming EMV standards. Long Island Game Farm's grand opening was featured on News 12 and Newsday. The School-Business Partnerships of Long Island hosted The 16th Annual Long Island Regional First Robotics Competition, which was covered by TV55's "Exit 10/55", The Long Island Business News, Newsday, and The Corridor. Alzheimer's Disease Resource Center held its annual Education Expo and Physician's Dinner. Featured in Sag Harbor Express, keynote speakers B Smith & Dan Gasby spoke on the challenges and triumph of becoming a cargiver to a spouse. The PP Medicaid website was posted. The Therapy Center for Children website was posted. Sanders, Thaler, Viola, & Katz, LLP had a holiday and New Year's e-card created. Also, an ad was created for Brian Gordon, CPA.